On August 3, Rahm Emanuel announced plans to reform Chicago’s pre-Kindergarten education system. Like other “reforms,” this one is likely to lead to privatization, lower-paid teachers, and test-driven pre-Kindergarten programs. The mayor’s plan fundamentally alters the funding structure for all early childhood education programs in Chicago, including Head Start (3-5 years old), Early Head Start (0-3), Preschool for All (3-5), and Prevention Initiative (0-3). His announcement was independent of CTU contract negotiations, and CTU was not consulted about this program. By November 2, 2012, at 4:30pm, all CPS principals who wish to provide their neighborhood with pre-Kindergarten classes for the 2013-2014 school year must submit proposals. All schools wishing to provide these programs must apply, even if the institution currently receives funding for early childhood. Program administrators can find the applications, instructions, and evaluation rubrics on Chicago’s Ready to Learn! website. CPS principals will submit their proposals to The Office of Early Childhood, at 125 S. Clark. Letters of intent are “encouraged but not required,” according to the Ready to Learn! website. CTU recommends that teachers encourage their principals to submit a letter of intent to readytolearnrfp@cps.edu before sending to full proposal. This letter of intent will allow principals to emphasize the proposed program’s strengths and supplement the more restrictive questions in the application. . CPS and DFSS will release its funding decisions in spring of 2013, leaving little time for parents to find a new program if their local school does not receive funding. The application process is very detailed and time-consuming. In order to compete with well-funded charter schools, CTU recommends that schools begin working on their proposals immediately. The rubric criteria includes more than simply the quality of education that children receive, but also places an emphasis on a program’s outside funding sources. Schools that can acquire large amounts of funding from private donors are more likely to receive a high score for their proposal. This appears to be another advantage for charter and parochial schools and could eventually allow CPS to significantly reduce government funding for early childhood education. Schools’ previous results from the new Kindergarten Readiness Test and Teaching Standards GOLD will be one of the factors used in evaluating proposals. This usage of test results to evaluate the quality of education reinforces CPS’s emphasis on standardized testing, even for young children, despite the tests’ questionable validity. For the 2012-2013 school year, the Chicago Board of Education has already approved approximately $6.4 million to be paid to private companies for testing software for kindergarten through second grade alone. The Kindergarten Readiness Test, which will be given to all students entering kindergarten, cost Illinois an additional $1.5 million, money that was diverted from the budget for the 2011-2012 school year. The competition does not end with the proposal. All early childhood programs must maintain 100 percent enrollment throughout the school year or risk permanently losing funding for unfilled spots. This funding will be given to a competing program that CPS believes can better maintain full enrollment. CTU is concerned that this process will result in a reduction of funding for public school programs, making it more difficult for teachers to educate their students. Emanuel said that the city will pay $10 million for the 2013-2014 school year in an attempt to expand early childhood education to 2,000 more children in 2013 and to 5,000 more in the next three years. No extra funding has been guaranteed past 2014, however. 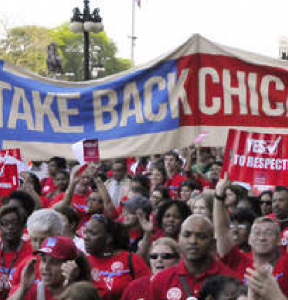 While this $10 million increase in funding will help reduce the damage caused by Governor Quinn’s $19 million cut to early childhood education, CTU has serious reservations about the mayor’s plan. 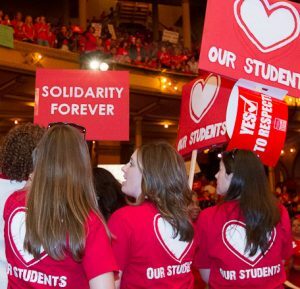 CTU believes that CPS should ensure that all schools receive the funding needed to educate students – especially in the critical area of early childhood education – rather than forcing public schools to compete with the private budgets of charter schools for the resources needed to provide a high-quality education. All children deserve an excellent education, and parents should not have to worry that their child’s program may lose this competition, forcing families to look outside of their communities for a new program. In May 2012, $4.7 million dollars was approved for two Wireless Generation programs. The contracts run from July 1, 2012 to June 30, 2013 with three options to renew for a length of one year a piece. Despite the cost, these K-2 tests will be optional for schools. In February 2012, the Board also approved a $5 million contract with the Northwest Evaluation Association (NWEA) for a computer adaptive test that will replace the Illinois Standard Achievement Test (ISAT) and will be administered to all K-8 students. This contract started on March 1, 2012, and will continue until February 28, 2013; the contract allows for three one-year renewals. Since CPS has included an end of the year test in its curriculum, it is highly likely that the contract will be renewed. Using 2011-2012 enrollment figures, about 33.4 percent ($1.7 million) of the $5 million contract will be used for K-2, bringing the total paid to private companies for the 2012-2013 school year to $6.4 million.